Welcome to Myrons Carburetor and Gas Tank Service Section. Carburetors and gas tanks get coated with sticky brown residue (tar, varnish, or gum) from gasoline and oil decomposing during years of storage. Steel gas tanks rust inside. Rust flakes damage gas valves (petcocks). Rust powder goes through fuel filters and clogs the tiny 0.010 to 0.025″ jet holes that the gasoline sprays through. Rust particles and fibers from cloth or hair can also make the float valve not shut off, causing a gas leak. Carburetor Gas Leaks: Most (but not all) gas leaks are from float valves not shutting off. A good working float and float valve assembly will float up and shut off the supply of gasoline before the level gets as high as the float bowl gasket. If the bike is standing up stationary, it would not matter whether it even had a bowl gasket. The float bowl gasket is for when the bike is leaned or the moved around, sloshing the gasoline inside. Warning: The following procedures are difficult and dangerous. You can easily harm your health, get blinded, or ruin the bike. Read all warning labels. Acetone especially is a very strong solvent. It’s the main ingredient of fingernail polish remover. It will instantly dissolve decal ink or spray paint. It will ruin rubber by making it swell up. It will etch (eat away the surface) paint and plastics quickly. Baked on factory paint takes a minute to be etched. Wear eye and skin protection and have cloth towels ready to catch any dribbles. Nothing else that’s safer than acetone or methyl ethyl ketone (MEK) will dissolve the tar. This is how Myrons Mopeds cleans gas tanks. These techniques may not be safe or appropriate for everyone. Use these prodedures at your own risk. 1. With the old gas still in it, shake up the gas tank. 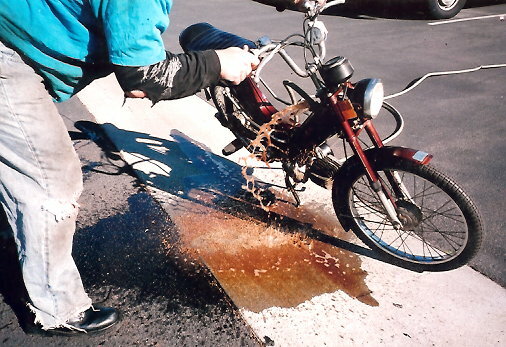 On a frame-tank moped, shake the entire bike by tipping it up on it’s nose (front tire), while holding the front brake, balancing the bike on it’s front wheel. This gets the solid material (rust flakes mostly) off the bottom and into the liquid about to be drained out. Do this just before removing the gas valve, so rust powder won’t have time to settle back to the bottom. 2. Remove the gas valve and drain the old gas out, with shaking. Look at what came out. Pure fresh gasoline is clear, colorless, and smells like gas. Fresh gas put into a tarry gas tank turns yellow after a few days. Yellow tint means tar is present. Cloudy means water is present. Solid brown, black, or orange particles or flakes are rust. Two-stroke oil is usually colored so it tints the gasoline, so you can tell how much oil is present by looking at it. A 50:1 mix of Champion tints the gas slightly green. Twice as much oil makes it twice as green. 3A. Cloudy only – water: Air dry the tank. Compressed air and summer sun help. Optional: Acetone or MEK 8oz rinse removes water quickly, no waiting. 3B. Dark color only – oil: Replace gasoline with correct mix, usually 50:1. Adding oil reduces the odor of gasoline. Pure gas smells strongest. 3C. Particles only – rust: Water flush with full blast garden hose to float out any loose rust flakes. Put the hose in the empty tank first before turning it on. Tip the bike so the water overflows to the side and not all over the bike. When “all” of the tar and loose flakes are removed it’s ready for EvapoRust. It’s a water-based product that chemically disolves rust, while not promoting re-rusting. Between a pint and a quart of Evaporust plus a two quarts of water almost fills a one gallon tank. Soak it for a day while shaking it vigorously (turning it upside down) once in a while. Then drain it out. Hose it with water from a garden hose. Remove all water ASAP before new rust can form. Use air, sun, or acetone for that. See above. 3D. Yellow color – tar: Soak the tank with acetone. Acetone costs $16/gallon, so it’s wise to cut it to 1/2 acetone and 1/2 gasoline, called a “cocktail”. With the gas valve hole plugged add the cocktail. Let sit for a day or so, with occasional shaking. On a frame-tank moped, tip it up on it’s fron wheel every half hour for 12 hours, or equivalent. Drain it out into a pan, with shaking. Examine how yellow and how much rust. Repeat as necessary. This is much easier said than done. 4. Additional techniques: A “whacker” is a 20″ piece of cable or a wire coat hangar spinning on a drill. It is useful for knocking rust flakes off the walls. A “chain” is a way of reaching to the far bottom, shaking or agitating vigorously, and then pulling it back out, thus stirring up the stew. A “pea light” is a tiny light small enough to pass through the 8mm gas valve hole, with stiff wires and a battery, for viewing the inside of the gas tank. You can sometimes see blobs of dark brown tar at the bottom, occasionally as big as a hand. A “geyser” is on a really bad tarry tank after a cocktail has soaked, you put a garden hose at the bottom of the tank, then turn it on full blast while tipping the bike away from you. The tar froth is lighter than water, and comes bursting out the open gas lid hole in a orange-brown geyser. The geyser gets the tar out the large top hole faster than repeated drainings out the tiny bottom hole. The geyser will make the ground orange colored and is not very environmentally friendly. Use your own judgement. 5. Professional Help: “Hot Tank” is what some radiator shops have to clean parts in. Hot tank will ruin decals and paint. “Sand Blasting” is what some radiator and automotive shops have. It also damages the paint and can miss hard to reach places. Either way you would have to remove the tank (or strip the frame bare, if the frame is the tank). 6. Holes in tank: Rust can go all the way through the steel wall and form a blister under the exterior paint. Sometimes the act of cleaning the tank causes leaks, which were there already but not active. When you see little mounds, bumps, especially near the bottom, it means that the gas is held in only by the paint. A leak could happen anytime. Just poke one with a pointed steel “poker” like a large safety pin or a sharpened nail. A light push will pierce through. Fortunately epoxy will seal the hole, once the area is clean and free of paint. It’s better to pierce the hole besides cleaning it, so the epoxy will form a plug. Mix a 50/50 two-part epoxy for bonding metal like JB Weld or PC-7, not the clear kind. What “rinse” means: On a frame-tank moped, “rinse” means first making a plug for the gas valve hole out of a bolt and a piece of fuel line, plugging the gas valve hole, adding the rinsing agent, which is acetone, tipping the bike up on it’s nose, sloshing the liquid violently to get the upper part of the tank, then setting the bike down, immediately pulling the plug off and draining out the rinse, while shaking the bike. Repeat the process until nothing bad comes out. 5. Not-frame Gas Tanks: If you can remove your gas tank from the frame, cleaning is much easier. Shaking it and seeing inside is easy. Pointed screws can be added to a mix of acetone and gasoline, then shaken vigorously. Dry wall screws are better than rocks because rocks leave sand grit behind. 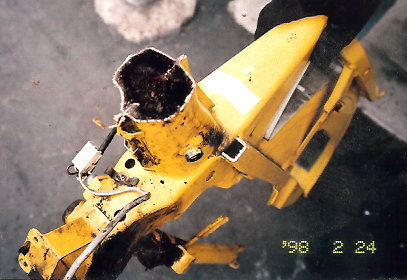 Left, a Motobecane tank, cut in half, is packed solid with tar. Right, a tank cleaning “geyser” of acetone, tar, and water. You are currently browsing the archives for the Gas Tank Cleaning category.